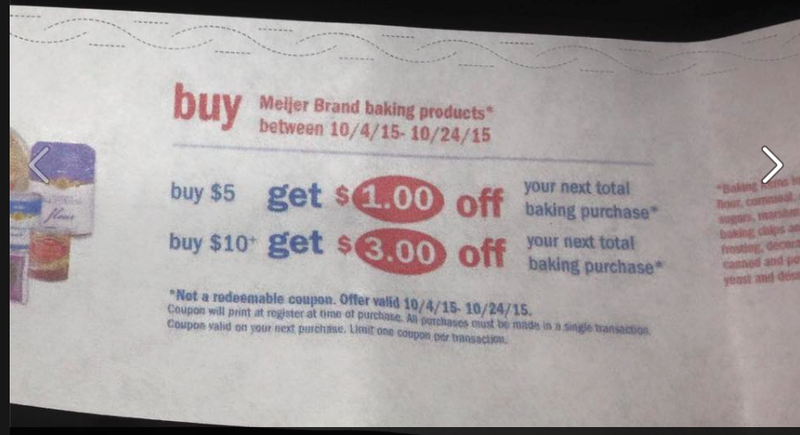 Thank you for everyone posting picture's in the Coupon Saving at Meijer group! Buy $5 get $1 off or buy $10 and get $3 off your next total baking purchase. Buy (2) Get $1, Buy (3) Get $2, Buy (4) or more and Get $3 off your next order. But (2) Get $0.50, Buy (3) get $1 or Buy (4) get $1.50 off your next total Pasta sauce and noodles purchase. Buy $5 get $1, buy $10 get $4 off your next total water purchase! Buy 5-9 get $1 or Buy 10 or more and get $2 coupon off your next purchase. Buy 1 get $0.75, but 2 get $2 or Buy 3 or more and get $3.50 coupon off your next shopping purchase! Buy (5) get $2, Buy (7) get $3 or Buy (10) or more and get $4 coupon to spend on your next purchase. Buy $5 get $1, Buy $10 and get $3 or Buy $15 and get $5 coupon off your next total laundry purchase. Spend $10 on Kleenex Facial Tissues and Hand Towels between 10/5-11/1/15 and get $2 coupon to spend on your next order. Buy 5 and get $2, buy 7 and get $3 or buy 10 and get $4 coupon off your next purchase. 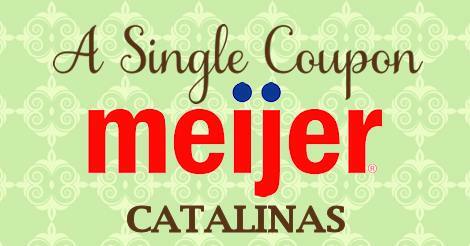 Buy 2 get $1, buy 3 get $2 or buy 4 or more and get $3 coupon off your next purchase. Get $5 coupon to use on a future order.